The amount of pedestrian fatalities has increased 4.2% in 2010, and pedestrians injured in motor vehicle accidents dramatically increased 19% to 70,000, according to data from the NHTSA. There is no explanation for this unfortunate increase of deaths. There are of course many speculations . Drinking is a major factor in pedestrian fatalities. Not only drunk drivers, but also drunk pedestrians. In fact, of the pedestrians killed, 35% of them were legally drunk. In 6% of fatal pedestrian crashes, both driver and pedestrian were legally drunk. Another problem is pedestrians distracted by cell phones and other devices. There have been cases where pedestrians are on their cell phones and do not pay attention to the walk sign and go when there is a green light for drivers. However, this is not good data on distracted pedestrian fatalities. With the economy in a down slope still, more people are choosing to walk or ride their bike to work, and as a result, more people are being hit by motor vehicles. Many roads are not designed to accommodate many pedestrians or cyclists. 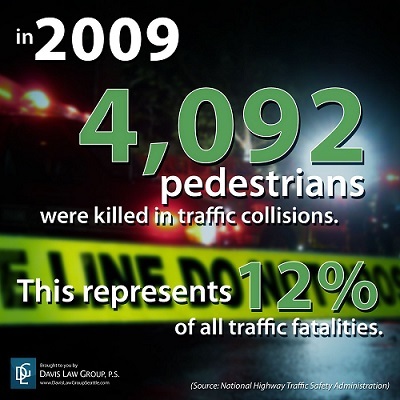 There are too many high-speed roads designed to move large numbers of vehicles without considering pedestrian safety. Pedestrians account for about 30% of all traffic fatalities involving children under the age of 15 years. NHTSA estimates that more than 22% of children between the ages of 5 and 9 who were killed in traffic crashes were pedestrians. Roughly 19% of children involved in traffic fatalities under age 16 were pedestrians. And approximately 8% of all children under age 16 injured in a car accident were pedestrians.